From left: Conor Hearn, Maura Scanlin, and Aidan Scrimgeour of BCM Fest act Pumpkin Bread. CAMBRIDGE — At the Boston Celtic Music Festival, Irish airs square off with rollicking Cape Breton fiddle tunes. You might hear a snappy Scottish strathspey in one room, and driving Quebecois foot percussion in another. Since 2003, the festival has gathered musicians from all the traditions that fit under the wide umbrella of “Celtic” for a homegrown weekend of concerts, dances, and sessions. Now, as the festival celebrates its 15th anniversary Thursday through Sunday, there’s even more room for those players to strut. For the first time, the festival will include four days of programming instead of two, allowing for many more hours of music, dancing, and community building. Club Passim in Harvard Square is the festival’s programming hub as well as its presenter, and nearby, the Sinclair will also host events for the first time. Some of the events are festival mainstays, like the locally focused Roots and Branches concert, informal performer-led sessions where anyone can join in on traditional tunes, and the Urban Ceilidh, a no-experience-necessary social dance at the Atrium with live music and dances from numerous Celtic traditions. There are also a handful of new features, such as an emerging artist showcase, a second full docket of daytime shows, and the “Festival Club” late-night concert, a cozy show for impromptu collaborations between performers. Heaton observes that some of the children who came to the festival in its earliest years are now formidable musicians in their own right, including piper Torrin Ryan, fiddler Galen Fraser, and fiddler Katie McNally, who performs this year. “BCMFest is in some ways the way that people have performatively gotten into the game, and I think even more importantly socially, how they’ve become part of the community,” she says. The members of Boston-based band Pumpkin Bread didn’t go to Berklee, but they might fall into that category. The band’s 2017 self-titled album is pure progressive folk fusion. Three of the five players shared their stories in an interview at Passim. Guitarist Conor Hearn grew up playing Irish traditional music. Maura Scanlin was trained in classical violin from age 3, and learned Scottish fiddle mostly by listening to “a lot of CDs in the car with my parents,” with lessons here and there. Accordionist and pianist Aidan Scrimgeour was trained in jazz and classical, and his dive into the world of traditional music began in Boston. 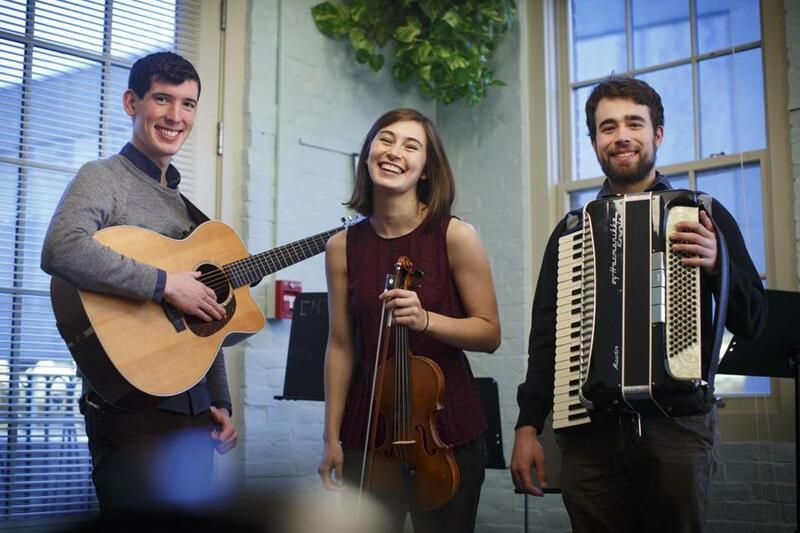 “What I know about Celtic music is what I’ve learned from these two, and being in Boston, and just playing with people,” Scrimgeour says.